The CWA-Envoy bargaining committee met with the company last week, discussing wages, benefits, vacations, overtime, training, travel pay, and expenses. The CWA committee is now working on a counter proposal on wages because the company's latest proposal is not good enough. The CWA team will return to the bargaining table on June 20. Check out the Facebook video update from last week's sessions by clicking here. 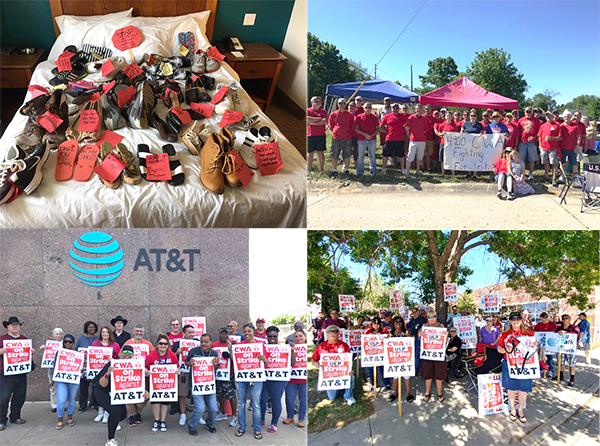 The CWA bargaining teams rejected AT&T's so-called "final offer" last week, and thanked CWA members for their tremendous member-led mobilization as many locals across the country participated in Unfair Labor Practice strikes, garnering significant media coverage. "There couldn't be a clearer, louder, or more powerful message sent back to the company than the one you sent them over these past days," the AT&T Midwest bargaining committee wrote in an update. "It has told the company that no matter how hard they try, or how many emails they send out, bargaining should be done at the table and not directly with the members." Read about the Unfair Labor Practice mobilization here. CWA members held events in Wadsworth, Ohio, and Jackson, Mich., calling on Congressman Jim Renacci (R-Ohio) and Tim Wahlberg (R-Mich.) to hold AT&T accountable for its tax bill job promises. CWA is also running online ads to encourage their constituents to ask them to speak up. You can view the ads here: Congressman Renacci, Congressman Wahlberg. Before the bill passed, AT&T promised that every $1 billion in tax savings would create "7,000 good jobs for the middle class." Instead, just days after the tax bill became law, the company announced more than 1,500 layoffs – compounding workers' concerns about the company's practice of shifting work to low-wage overseas contractors. Above: Many CWA locals across the country participated in member-led Unfair Labor Practice strikes over AT&T trying to circumvent the collective bargaining process. Below: CWAers and allies gathered in Jackson, Mich., to call on Tim Wahlberg (R-Mich.) to hold AT&T accountable for its tax bill job promises. 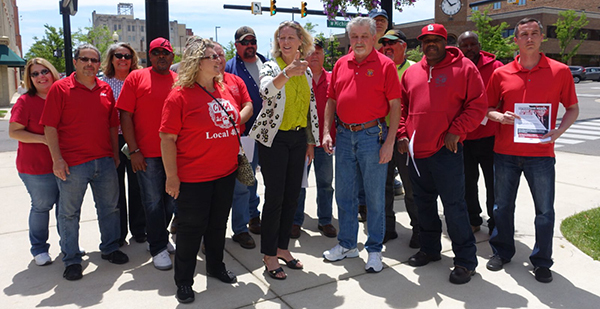 They were joined by CWA-endorsed candidate Gretchen Driskell (center), who is running against Wahlberg in the 2018 election. 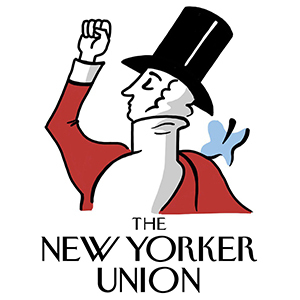 Employees at The New Yorker have announced that they are joining together to be represented by the NewsGuild of New York/TNG-CWA Local 31003. "We believe that the ability to collectively bargain is the best way to secure a fairer workplace and to insure that the people who produce The New Yorker can continue to do so far into the future," said the organizing committee in a statement. CWA members and allies across the country continue to put pressure on corporations and elected officials to stop sending call center jobs overseas. 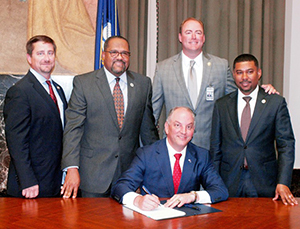 From left to right: CWA Local 3403 President Dwaine Henderson, State Senator Troy Carter, CWA Local 3411 President Matt Wood, Rep. Gary Carter, and Louisiana Governor John Bel Edwards at the bill signing ceremony. In a big victory for CWA members, Louisiana Governor John Bel Edwards signed a bill into law last week giving the state the ability to claw back tax incentives when corporations don't keep the employment promises they make. The bill, introduced by Louisiana Senator Troy Carter, was spearheaded by CWA members in order to crack down on call center employers that utilize state tax dollars and then move work out of state. CWA members gathered in Albany this week to call on state legislators to pass the "Save New York Call Center Jobs Act," a bill aimed at stopping the trend of companies moving call centers out of the state that makes companies offshoring call center jobs ineligible for certain tax preferences and grants and loans for five years. CWA members across the state have been pushing hard for this important legislation. CWAers have sent 1,660 postcards to N.Y. State Senators and made more than 620 calls to Senate offices. As a result, the bill passed the New York State Assembly 111-21 with 68 cosponsors and broad bipartisan support, and is currently awaiting a vote by the State Senate where it has 39 cosponsors, including seven Republicans. 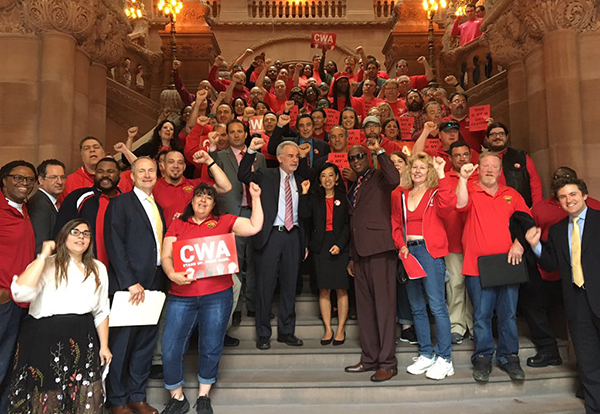 CWA members gathered in Albany this week to call on state legislators to pass the "Save New York Call Center Jobs Act," a bill aimed at stopping the trend of companies moving call centers out of the state. Here's just a sample of some of the work that CWA members are doing across the country on the Poor People's Campaign. CWAers and retirees in Arizona have been participating in nonviolent direct actions and teach-ins every Monday and Tuesday. CWAers from Ohio joined pastors and other advocates at the Poor People's Campaign kick off "moral revival" rally at the Statehouse. Ohio's campaign specifically calls on gubernatorial candidates Mike DeWine and Richard Cordray to support a $15 minimum wage, keep SNAP, and protect Medicaid expansion. CWAers also delivered a Bill of Rights letter to Governor John Kasich to support the Poor People's Campaign agenda. CWAers, along with UAW members and other community groups, participated in the Michigan Poor People's Campaign kick off in Lansing. They demanded a massive overhaul of the nation's voting rights laws, new programs to lift up the 140 million Americans living in poverty, immediate attention to ecological devastation, and measures to curb militarism and the war economy. Actions on Education, Living Wages, Jobs, Income, and Housing are coming up next week. Click here to learn more and sign up for events in your area. 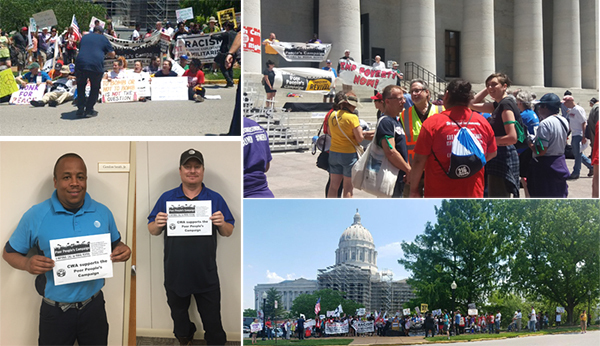 CWAers have been joining tens of thousands of people across the country to participate in nonviolent direct actions to fight back against the structures that are undermining our democracy and supporting economic injustice. A new report from Jobs with Justice finds that many large corporations have boosted their profits by forcing employees to work off the clock, cheating them out of required overtime pay, and engaging in similar practices that together are known as wage theft. The detailed analysis of federal and state court records shows that these corporations have paid out billions of dollars to resolve wage theft lawsuits brought by workers. Walmart tops the list of most-penalized employers, which also includes Bank of America, Wells Fargo and other large banks and insurance companies, as well as major technology and healthcare corporations. AT&T paid out more than $139 million to resolve wage theft cases, despite being extremely profitable and making $29.5 billion in 2017, while Verizon paid out nearly $39 million, and Digital First Media paid out more than $22 million. CWA District 3 Vice President Richard Honeycutt (left) with CWA Local 3808 member and AT&T wire technician James Shaw, Jr., who was honored for his bravery. CWA members gathered in Ft. Lauderdale for the annual District 3 Conference. District 3 Vice President Richard Honeycutt, AFA-CWA President Sara Nelson, District 6 Vice President Claude Cummings, and CWA Chief of Staff Jody Calemine spoke to the members about how the labor movement is mobilizing to make CWA STRONG. 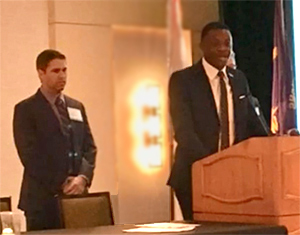 Honored at the conference was CWA Local 3808 member and AT&T wire technician James Shaw, Jr., who heroically stepped in to stop a gunman during a shooting at a Waffle House in Antioch, Tenn., in April.